Leonard H. Lavin at Del Mar 09.03.2006. Photo by HorsePhotos. In recognition of a career marked by enduring accomplishments in racing, breeding and devotion to the Thoroughbred industry, the National Thoroughbred Racing Association (NTRA), Daily Racing Form and the National Turf Writers And Broadcasters today announced that Leonard Lavin of Glen Hill Farm will be honored with the Eclipse Award of Merit for a lifetime of outstanding achievement. The presentation of the Award of Merit will take place at the 45th Annual Eclipse Awards dinner and ceremony on Saturday, January 16, at Gulfstream Park Racing & Casino in Hallandale Beach, Fla. The Eclipse Awards are presented by Daily Racing Form, Breeders’ Cup and The Stronach Group and produced by the NTRA. 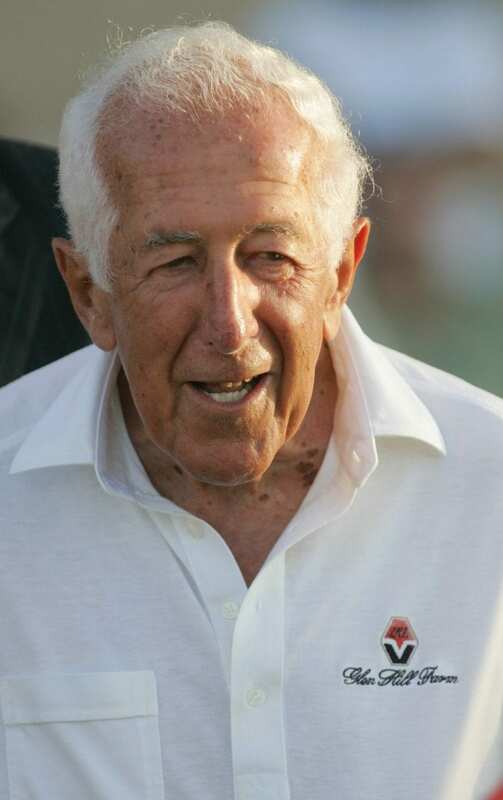 Born in Chicago in 1919, Lavin told the Ocala Star Banner that from the time he was a 9-year-old and saw Reigh Count win the 1928 Kentucky Derby, he has always held a special place in his heart for horses, and for Ocala, which has been his family’s “second home” since 1966, when he and wife Bernice, who passed away in 2007, bought their first horse. Under the care of Hall of Fame trainer Willard Proctor and his son, Tom, the Glen Hill racing and breeding operation has produced more than 80 stakes winners, including 1994 Breeders’ Cup Distaff winner One Dreamer. Other Glen Hill stakes winners include Relaunch, Convenience, Top Rung, Concept, Win, Repriced, Rich in Spirit, Closeout and Marketing Mix. Relaunch probably is the best-remembered horse who raced with the iconic Glen Hill silks. After a distinguished racing career, he went on to become a prominent sire. His numerous stakes winners campaigned by Lavin include Potentiality, Carload, Media Plan and One Dreamer. Lavin also recalled the 1972 match race victory by his filly Convenience over national champion Typecast as his greatest racing highlight. The event drew more than 50,000 people to Hollywood Park. In 1947, while working in sales at a national consumer products company, Lavin met Bernice Weisner at a dance. They were married six months later. In 1955, the Lavins purchased a West Coast beauty supply company and its top product, Alberto-VO5 Conditioning Hairdressing, and moved the operation to Chicago. Over the next 40 years, through entrepreneurial spirit, creative product production and innovative consumer marketing on television, the Lavins built Alberto-Culver Company into a household products and personal beauty care American success story. In 2010, Alberto Culver was sold to Unilever for $3.7 billion. Displaying his commitment to racing, Lavin contracted Alberto-Culver Company to become a Breeders’ Cup race sponsor in 1990, and continued to sponsor the event through its products, until 2005. Lavin, who is the author of Winners Make It Happen: Reflections of a Self-Made Man, has won countless awards and honors for his philanthropic, civic, and business endeavors. The Lavin family also has supported numerous racing-related charitable causes. A complete list of past Eclipse Award winners, including the Award of Merit recipients, can be accessed online. Tickets to The Eclipse Awards ceremony are on sale for $400 each or $4,000 for a table of 10. For reservations, please contact Casey Hamilton of the NTRA at [email protected], or call (859) 422-2627.